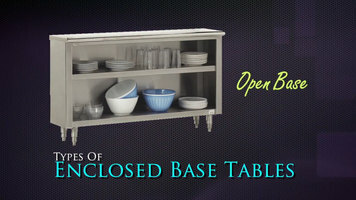 Sink on Right Advance Tabco BEV-30-144 Enclosed Base Beverage Table - 144"
In addition to open base tables, Advance Tabco offers a variety of enclosed base tables including sliding door and hinged door styles. Sliding doors glide with ease and feature integral door tracks with no breakable parts, and are removable for cleaning purposes. Another option, the hinged door table, features a noise-reduction design and stays closed magnetically for an efficient solution to your preparation and storage needs. Unites are also available without doors, and all can be customized with a flat top, a 1 1/2" backsplash, or a 5" backsplash. For storage convenience, choose between a fixed or adjustable mid-shelf. Adjustable stainless steel bullet feet ensure that the table is level, and the standard 6" clearance allows for easy cleaning. Made of heavy duty 14 gauge, type 304 stainless steel, these base tables are built to last. This informative video will provide you with a brief overview of the design features and benefits of the Advance Tabco enclosed base tables! This Advance Tabco BEV-30-144 enclosed base beverage table is the perfect way to organize hot and cold beverage centers at server stations or in cafeteria type settings. It features a 10" high full length backsplash with a standard outlet for plugging in coffee brewers or cold beverage dispensers. Two undershelves provide ample storage space for back up mugs, glassware, dinnerware, or trays. 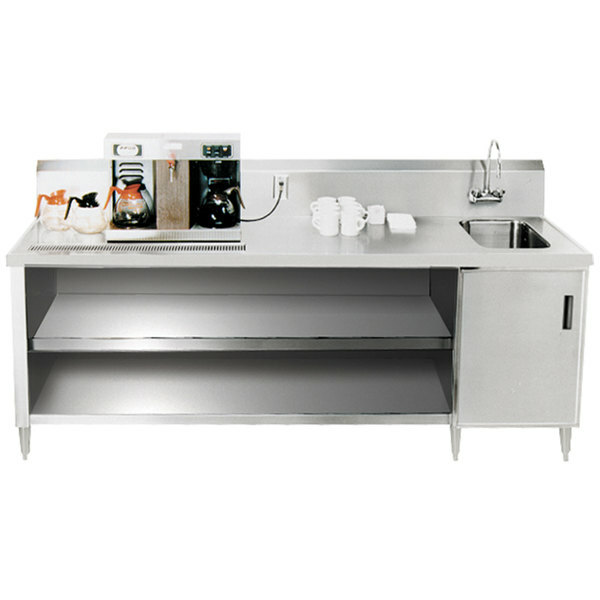 The beverage table's countertop is made of heavy duty 14 gauge type 304 series stainless steel that is polished to an eye-catching mirror finish, while the body is made of 18 gauge type 304 series stainless steel. The countertop is furnished with an embossed no-drip offset edge, which helps contain drips and spills and channels them into the table's built in urn trough. The Advance Tabco BEV-30-144 enclosed base beverage table also includes a 14" x 16" x 12" sink with a splash mounted gooseneck faucet. Work Surface Height: 35 1/2"
Advance Tabco BEV-30-144 Enclosed Base Beverage Table - 144"